Layer different cakes or pudding for more colorful "dirt." A dirty little secret of baking is that it is wickedly easy to learn how to make dirt cake. Whether you opt for a simple no-bake option or a more complicated baked and decorated cake with a dirt theme, this dessert can be a fun and creative option for adults and kids alike to enjoy. The most popular dirt cake recipes come in two varieties: no-bake pudding "cake" desserts and baked cakes decorated with a sweet cookie crumble "dirt." No-bake dirt cake isn't technically cake, it is a layered pudding dessert. It can be an easy way to introduce a child to baking, however, and it is a quick dessert to whip up whenever a sweet treat is needed. Prepare pudding mix as directed and chill until firm. Crush sandwich cookies and divide equally. Divide prepared pudding into two equal halves. Put half the prepared pudding into a trifle bowl or similar serving dish. Mix half the crushed cookies into the remaining pudding. Layer the cookie-mixed pudding on top of the plain pudding. Top the layered dessert with the remaining crushed cookies. 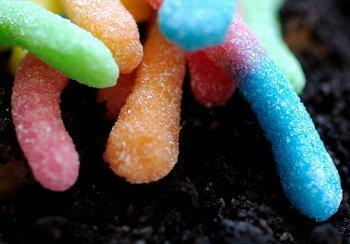 Press gummy worms into the top part of the "dirt" with the ends visible. This simple way to prepare a no-bake dirt cake can be mastered in a few minutes, but there are other options if you want to make it a more elaborate treat. Choosing different types of cookies will give the "dirt" a different texture, and opting for milk chocolate pudding or dark chocolate pudding will vary the color of the treat. For a larger dessert, prepare different puddings and create layers that make fun sedimentary layers in the dirt, or add layers of pound cake or angel food cake chunks for simulated rocks. A baked dirt cake can be more elaborately decorated than the no-bake pudding variety, but starts with a similar simple recipe. 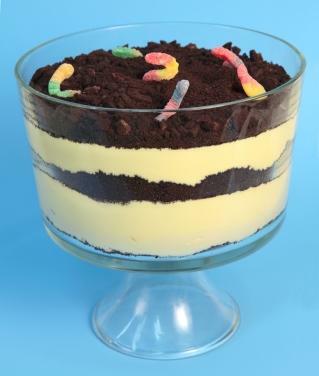 Gummy worms are great dirt cake decorations. Bake cake mix or recipe according to directions and allow to cool completely. Any size or shape cake is acceptable. Stir icing or frosting well to aerate. Crush chocolate sandwich cookies and divide into equal parts. Mix half the crushed cookies into the icing. Decorate cake with gummy worms, pushing ends of the candy into the "dirt" if desired. This simple dirt cake can be a hit at children's birthday parties, and adding more effort to the decorating to create a themed cake can make it an appropriate choice for a number of different occasions and celebrations. While a simple dirt cake is a fast, easy, everyday dessert, there are a number of ways to incorporate a theme into the basic design for a more elaborate cake. Gardening: Candy or silk flowers growing out of a dirt cake can be a whimsical design for a gardening-themed cake. Children's toy gardening tools make excellent accessories or servers for the cake, or the no-bake dirt cake can be served in toy buckets for a colorful and creative option. Halloween: To turn a dirt cake into a fun Halloween treat, use miniature chocolate candy bars to create rows of tasty headstones for a graveyard cake. Marshmallow ghosts, candy spiders, and other spooky treats can also be great decorations for a Halloween dirt cake. Construction: Small construction toys can be placed on a dirt cake as easy decorations, and the icing can be artfully arranged to mimic holes and furrows for equipment. A small balsa wood frame can also be used for a home construction celebratory cake. Dinosaurs: Decorate the top of a dirt cake with candy bones for a dinosaur theme, and add one or two small dinosaur figurines for a colorful touch on the cake. Gummy dinosaurs buried in the cake are another option that will allow children to become dessert paleontologists. Beach: Instead of chocolate cake and chocolate cookies, use a vanilla cake (or pudding) and vanilla cookies to create a beach-themed "sand" cake. Decorate the cake with candy shells, mini beach umbrellas, and other fun tropical trinkets. Learning how to make dirt cake is fast and easy, and once you know one of the basic recipes, you can use the cake for a variety of different cake themes and special occasions. With a little creativity, you can get a little dirty with any dessert!